LANSING – In a field of LGBT support where it seems that all the efforts are still never enough to meet the demand, another group, resource, grant or volunteer effort is always welcome for youth. 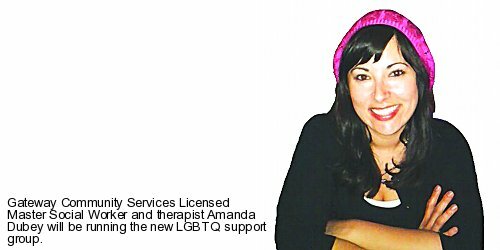 As such, when Gateway Community Services Licensed Master Social Worker and therapist Amanda Dubey brought up the idea to form a support group for LGBTQ teens in the area, everyone was on board. Tentatively set to start on Sept. 21, Gateway – a well-known mid-Michigan resource for homeless and at-risk youth – is branching out to offer a support group specifically geared toward helping local LGBTQ teens sift through the issues they face every day. Whether it’s struggling to find one’s identity, dating, family conflicts or simply social interaction that teens need, Dubey hopes to provide a new venue to help Lansing youth sort it all out. Indeed, Gateway is no stranger to the realities LGBT youth in particular face. The survey numbers sum up the stories that all gay youth and their allies know: According to the Report of the Secretary’s Task Force on Youth Suicide from the U.S. Department of Health and Human Services, almost all public high school students regularly hear homophobic remarks, and 53 percent report hearing them from staff. Thirty percent of all youth suicides are committed by LGBTQ youth, while 40 percent of homeless youth identify as gay, lesbian or bisexual. An astounding 44 percent of LGBTQ youth reported anti-gay abuse, discrimination or harassment by their own families. It’s no wonder then, says Dubey, that Gateway saw the need to put specific efforts forward to help LGBTQ teens. Similarly to metro Detroit’s Ruth Ellis Center, Gateway offers transitional living to homeless youth, as well as an emergency shelter. Up to 11 youth at a time call Gateway’s Kevin J. Moody house their home through the organization’s Crossroads program. Their Higher Ground program offers individual and family counseling, an emergency shelter and crisis intervention. In addition, Gateway also hosts a Street Outreach team, which finds homeless youth and brings them necessary items, such as blankets, food and clothing. Currently, they have no drop-in center or “hang out” for area youth. And never before has Gateway hosted a group specifically for LGBTQ youth, and Dubey hopes that the effort – which is currently funded for one year by the Lansing Association for Human Rights – will pay off big-time for teens. The group, says Dubey, will also feature guest speakers and social outings, in addition to support and discussion sessions. Dubey and her intern, who is helping to set up the group, are also communicating with a local teen clinic, asking around in the Lansing gay community and posting information about the group in local teen hang-outs. And hopefully in the future, Gateway will also be able to expand its services and options for LGBTQ youth. The desire to do so is there, says Dubey, who notes that all Gateway staff are incredible allies. As always, it’s a matter of time – and funding – before the center can grow its efforts in that arena. As Dubey knows, there will always be more that needs to be done.